Construction Geometry in Autodesk Inventor - Is it Really Necessary? Construction geometry in an Autodesk Inventor sketch is one of those topics that doesn't often get talked about. It's not shiny or flashy, it just sits there and quietly does it's job. Usually, construction geometry's job is to help position a sketch, or to help apply constraints, such as a symmetry constraint to the sketch. The question I pose in this post is, should I change a line's properties such that the line's acts as a construction line in the "Inventor sense"? I consider using construction geometry a good practice, although "no Inventor police will take you away if you don't do it". In many cases, little difference might be seen between setting construction geometry, and not setting construction geometry. So what is the difference, and why bother setting construction geometry? Here's a sketch where I've used horizontal and vertical lines to help set position, and symmetry for a sketch. The lines are all standard sketch lines. No lines have been set to construction. The first thing that usually gets noticed is when the sketch is extruded into a solid. The sketch is now cut up into regions, because Inventor sees each line as a potential boundary for the extrusion. In this case, I have to pick four different regions to extrude this entire sketch. Now picking four regions might not be a big deal. It's just a few extra clicks, right? But now what if you need to put a draft, or taper angle, on the same solid. The image below shows the result, since the sketch sees the internal lines as edges for the extrusion, it applies the taper there as well, created the "waffled" solid that might not be the desired result at all. So what happens if I change the properties of the internal geometry to "Construction"? 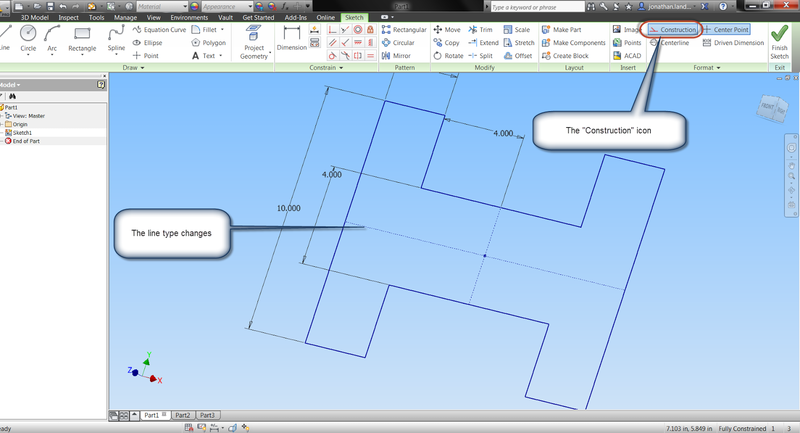 I'll do that by selecting the geometry I want to change, and clicking the "Construction" icon. The line types will change to reflect the property change. The internal lines after being changed to Construction. But now, when I extrude that sketch, the behavior of the extrusion changes. First, I don' t have to pick the sketch in quadrants anymore. That's because the internal lines, set to be construction, are ignored as sketch boundaries. Now the extrusion can be created in one step. Secondly, if I need to apply a taper, my result is completely different. That's also because Inventor doesn't use Construction geometry as boundaries for a feature. The waffled feature disappears. With Construction geometry, no waffle! So there's a little bit on construction geometry, and why it's worth considering. There might be plenty of places it doesn't matter, but in cases like the above, it can be useful. I encourage you to take a look. And of course, here's a video (with my somewhat raspy voice this week) below! My argument for construction geometry has always been model robustness. If there's only one valid profile in a sketch, that profile will always be used even if the sketch changes shape (e.g., if geometry that the sketch refers to changes). I've seen cases where a sketch without construction lines was used and one of a number of regions was selected for extrusion; when other parts of the part were edited and the model was regenerated, Inventor chose a different region to be extruded instead. 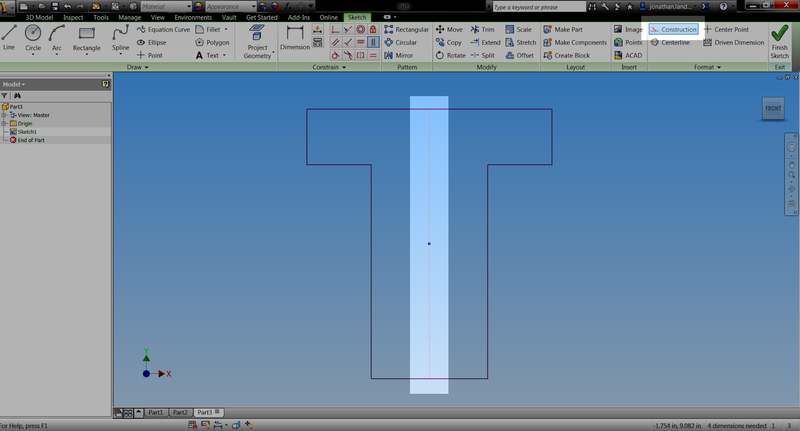 Using construction geometry so that there is only one sketch profile forces Inventor to extrude the correct region. Thanks for your input, Ian. I haven't run into the case you describe myself, but that's a good example of why construction geometry is worth the "headache". I used to be a lot lazier about it, but I've found that things to flow a lot smoother if I take that extra minute to set my construction geometry. Ian's mention is VERY prevalent in my work, and is a very good reminder for new and seasoned users. When you can create a clean, singular profile in a sketch you should. Unfortunately, it is often not reasonably feasible to do so. However, where possible, I highly recommend using the construction geometry to keep things as clean as possible. Thanks for the article Jon. I encourage all my staff to use construction geometry. Even if its only for projected geometry. Often you have to draw over the top of projected geometry because Inventor won't allows its use it some sweep paths, extruding surfaces and a few other things. Most often this relates to using a combination of projected and drawn geometry. ie. : sometimes it will let you use one or the other but not both. So the benefit of changing it to construction geometry comes in the form of better profile/path calculation and ease of editing at a later date (you can tell the difference between the two when selecting them, but you can't easily tell if one isn't construction). There is a bug in 2013 though, it may be in 2014 but I haven't tested it yet. Even though you change the projected (or any other) geometry to construction, if you have a coincident (point to point, not point to line) constraint between construction geometry and normal geometry it messes up the profile calculation and causes it to fail. It's been reported and I would assume its high on Autodesk's fix list.